DARPAN Awards 2018 was a magical night. The Cadillac-sponsored red carpet was buzzing with prominent members of the South Asian community, political dignitaries and socialites; the beautiful cocktail lounge sponsored by Handy Appliances had guests mingling and enjoying the hospitality; the awards event added shine and glamour to the event. It was a night to remember and cherish. 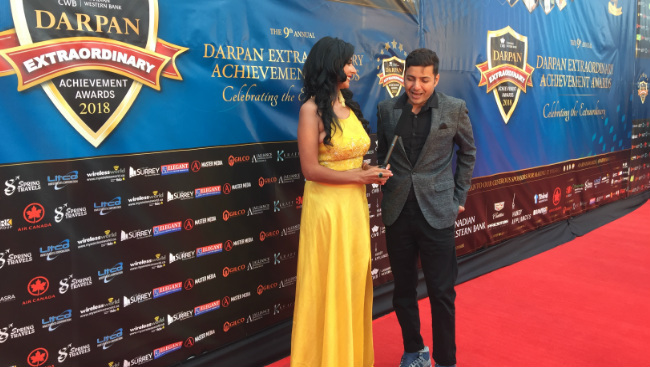 DARPAN Magazine, hosted its 9th Annual Awards in the company of esteemed social, business and political elites. This spectacular red carpet event took place at Aria Convention Centre in Surrey on September 14. With over 700 guests in attendance, this black-tie affair commenced at 6 p.m. in the backdrop of glamour and grandeur. On the red carpet, a live media station interviewed our esteemed guests asking them their expectations for the evening, photographers were busy capturing beautiful moments; and dancing performances set the stage for the night ahead. Ten amazing individuals from the South Asian community were recognized for their extraordinary achievements and for reflecting their heritage in a remarkable way. Canadian actor and television personality Huse Madhavji was the Master of Ceremonies for the event. This multi-talented host, actor and producer is the former face of Star! Canada and has starred in HBO Canada/Direct-TV’s hit comedy Call Me Fitz starring Jason Priestly, where he received his first Gemini nomination and NBC/CTV hospital drama Saving Hope. MC Madhavji kicked off the festivities, which included musical entertainment by well-known singers Komal Rizvi and Parichay; and the much-anticipated Awards ceremony. The Guest of Honour and Keynote Speaker this year was Afroz Shah, a Mumbai-based environmentalist and lawyer who is leading the environmental movement in the city and tackling plastic pollution and other harmful concerns one step at a time. Shah started the biggest beach cleanup project in Mumbai, Maharashtra, all by himself in 2015. Heartbroken after seeing the Versova beach near his house filled with garbage and all kinds of trash, Shah decided to take matters into his own hands – literally. He along with a senior neighbour started picking up garbage from the beach everyday. United Nations Environment Program (UNEP) honoured Shah with the Champion of the Earth award for his work in organizing community-led clean-up efforts. Also spotted at the event were prominent political guests like BC Minister of Citizens’ Services Jinny Sims; MLAs Stephanie Cadieux, Andrew Wilkinson, Harry Bains, and Marvin Hunt; and MPs Sukh Dhaliwal and Randeep Sarai, among many others.